* Mariell's opulent Gold multi wholesale evening bag will accessorize any dress for weddings, mothers of the brides, galas, bridesmaids, proms or nights on the town. 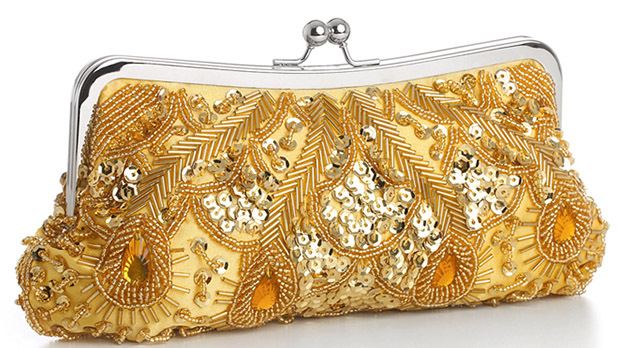 * Our 10" w x 4 1/2" h Gold satin evening bag has multi tones of gold seed beads, bugle beads, sequins & topaz gems to adorn all shades of gold gowns. * Our beaded clutch purse has a silver frame with kiss clasp & detachable silver wrist & shoulder chains. * This beaded evening clutch purse has generous room for a phone, keys, wallet & make up.